We’ve sorted through the noise to bring you the top branded apparel trends for 2017! Retail ready! According to the 2017 Wearables Sales Forecast, half of promotional apparel buyers are looking for garments they see at retail. They want the same style, quality and brand names. Heritage and vintage style tees are in high demand in retail and that has transferred over to logoed apparel lines. Heritage tees are typically ringer tees, baseball tees and varsity tees that have a retro look but contemporary performance features like moisture-wicking and cooling attributes. Polo shirts are a mainstay of corporate and business casual wear. In 2017 traditional menswear prints have expanded from wovens into the polo marketplace. Everything from gingham, checks and tattersall are helping to dress up polos. Retail styles are also making it into logoed polo shirts: popular colors like navy, blue and indigo; color blocking and tipping; and performance features like moisture-wicking and odor control are hot this year. Garments with heathered fabric may be the hottest trend of 2017. In fabric, heather refers to yarns of mixed color interwoven to produce flecks of an alternate color in a muted shade. Most often it is used to mix shades of grey with another color or another shade of grey. Heather pieces are expected to dominate polos, T-shirts, fleece and performance wear in branded apparel trends. The use of heather adds visual interest to a garment and helps it to stand out among similar style apparel pieces. sleeker styles to dress them up. Millennials and the fashion forward are flocking to this trend. Camouflage-patterned apparel isn’t a new trend but continues to grow in 2017! Camo can convey an outdoorsy look and country-cool appeal on everything from caps, fleeces and shirts. In addition to full-coverage camo prints, designers are using it as accent on women’s pieces. 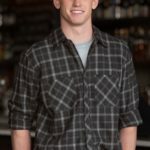 Denim and flannel shirts are growing in popularity, but there is no replacing the corporate-image button-down in the branded apparel industry. This year wovens have performance features like moisture-wicking fabrics and stretch materials for a subtle update to keep them in demand. 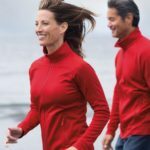 Athleisure, comfort clothing, athluxury – the trend is hot! 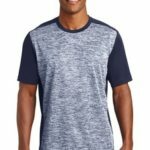 Casual athletic clothing being worn in settings like work and social occasions demand high quality apparel that holds up. 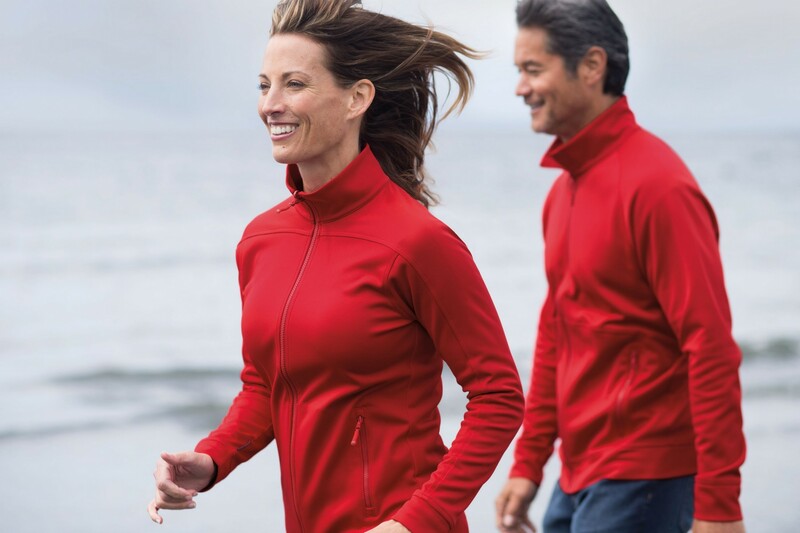 Everything from moisture-wicking T-shirts, zippered warm-up jackets and yoga pants are designed to take someone from work to their workout without changing. As office environments are becoming less formal we’re seeing office dress codes changing as well. Women’s wear will define itself this year. Shades of pink are expected to make a strong comeback after they were shown on the catwalk. Pleats are being used to dress up a staple or create interest in dimension. Silhouettes are trending more feminine and simple, they can be fluid or structured but they have a camp feel about them that makes the wearer feel good about herself. Whatever style you want to try PCi can help you update your branded apparel look. Let us know what looks your dying to try! Contact us today!